The “Get your rhythm back” slogan coupled with the vibrant pink packaging truly gives the essence that this supplement can help women overcome the discomforts of menopause. Claiming to relieve menopausal symptoms, Estro Rhythm prides itself on its all natural supplication to the sometimes harmful hormonal replacement therapies. But with all the supplements on the market, why should this once be considered a successful product? In order to answer that question, let us take a closer look at its mechanics. For tablet consumption, one tablet of Estro Rhythm should be taken 2 times a day. Although it is highly recommended that both pills be taken in the morning, they can be separated and consumed at different times. Concerning the cream, apply one pre-measured package of Estro Rhythm cream to an area of fatty tissue daily. For best results, apply in the morning to dry, clean skin. Users are cautioned not to apply Estro Rhythm cream along with other creams. 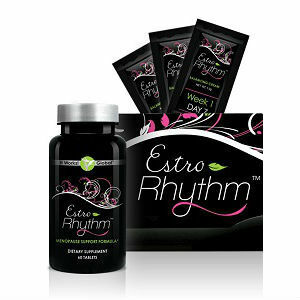 One package of Estro Rhythm, containing tablets and creams, can be purchased for $79.00. This purchase allows users to receive a 30 day supply. There is no indication that customers can receive any form of discount. After researching this particular product, it has been concluded that no form of a guarantee comes with a purchase of Estro Rhythm. A company should always back their product with some form of a guarantee as this creates security for those who are considering their product. After reviewing the information provided above, it seems that although Estro Rhythm could help women in menopause, there are several inconveniences which accompany this product. The first concern is the benefits. While Estro Rhythm does state that it helps relieve symptoms, it is not specific. Because women are not given specific details as to which symptoms this product relieves, they might be buying into a product that can do nothing for their discomfort. A second concern is the treatment method. Having to apply a cream could cause trouble. While women may be in the habit of consuming pills, a cream application may be harder to remember thus increasing the chances that full dosages will not be applied. A third concern is the guarantee. Because women do not know exactly what symptoms this product covers, they are essentially risking their money on a product that may provide no help whatsoever. Jackie Horowitz	reviewed Estro Rhythm	on October 25th	 and gave it a rating of 2.